Please help Kopy Kat Sanctuary raise money for our cats and buy lots of yummy Sarris Candies for Easter. 2. Scroll down and on the left side there will be an image that says: “Online Ordering” and click the drop down box to choose products. 4. Begin your online shopping. 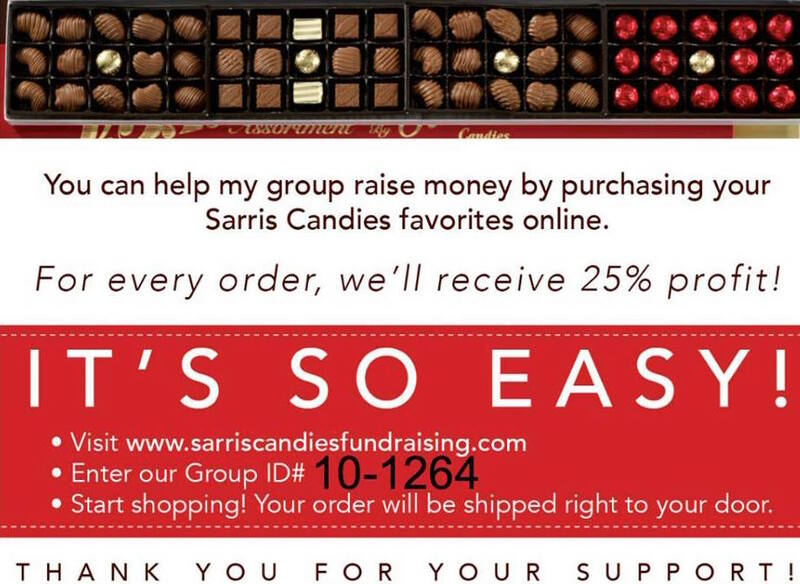 You will pay Sarris directly and they will ship directly to you. Besides a few of our amazing volunteers having a few tix left we are SOLD OUT! 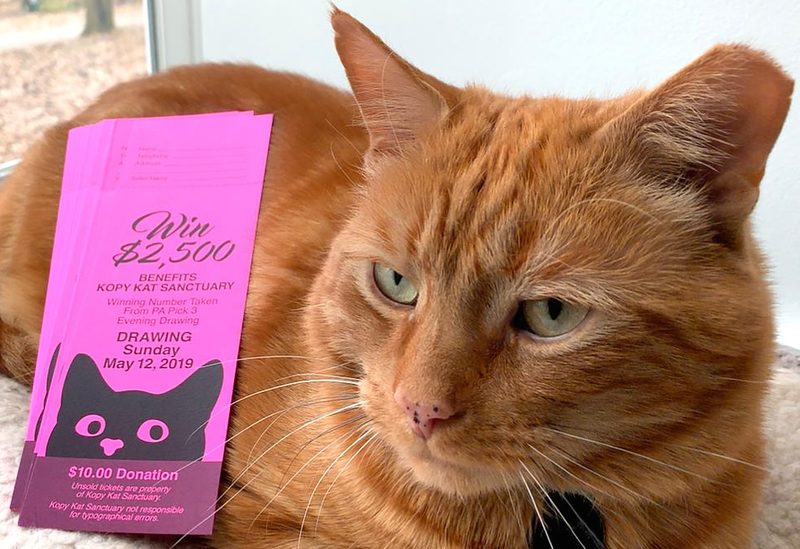 You can also purchase tix by going to our Kopy Kat Sanctuary Web Site by clicking on the Donate page at the link below. We will then send you a picture of your tickets. 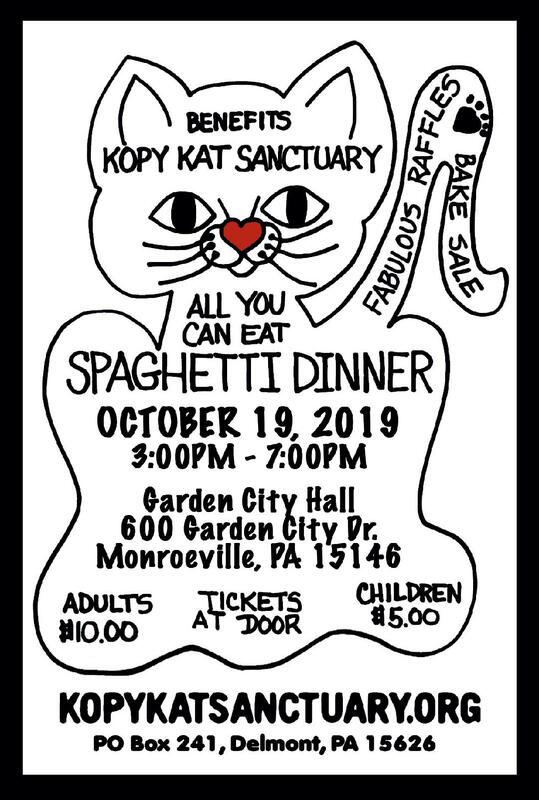 Kopy Kat Sanctuary is super excited to announce our 10th Annual All You Can Eat Spaghetti Dinner! $10.00 Adults/$5.00 Children under 11. Fabulous raffles and bake sale! Includes tons of spaghetti with the best homemade sauce (meat/vegan) in Pittsburgh, salad, bread, butter and drinks. Does NOT include dessert, but there is so much to choose from over at the bake sale table that there will be something for everyone. We even have vegan and gluten free treats. Tickets are available from KKS volunteers or they can be purchased at the door. We will also have takeout available! Calling all BAKERS in Pittsburgh. WE really need people to PLEASE volunteer and bake some goodies.We would love cookies, cakes, pies, brownies, cupcakes, pizzelles, …fattening, vegan, gluten free, sugar free, nuts, no nuts….you name it the sky is the limit. If you would like to be a SPONSOR let us know. We could not do this without our generous sponsors. Please consider sponsoring again or being a new sponsor. For a minimum donation of $25.00 you will get your name/business name, address, phone number & web address listed in our program and in our slide show. You can pay with Paypal on our web site at the link below. Please make sure you leave a note that clearly states how you would like to have your information listed as a sponsor. Purrfect Fence has protected nearly 40,000 cats for individuals, vet clinics, rescues, and shelters across the globe (on every continent except Antarctica!) Purrfect Fence offers patented fencing systems, catios, and enclosures to ensure your cat(s) are safe and happy outdoors! 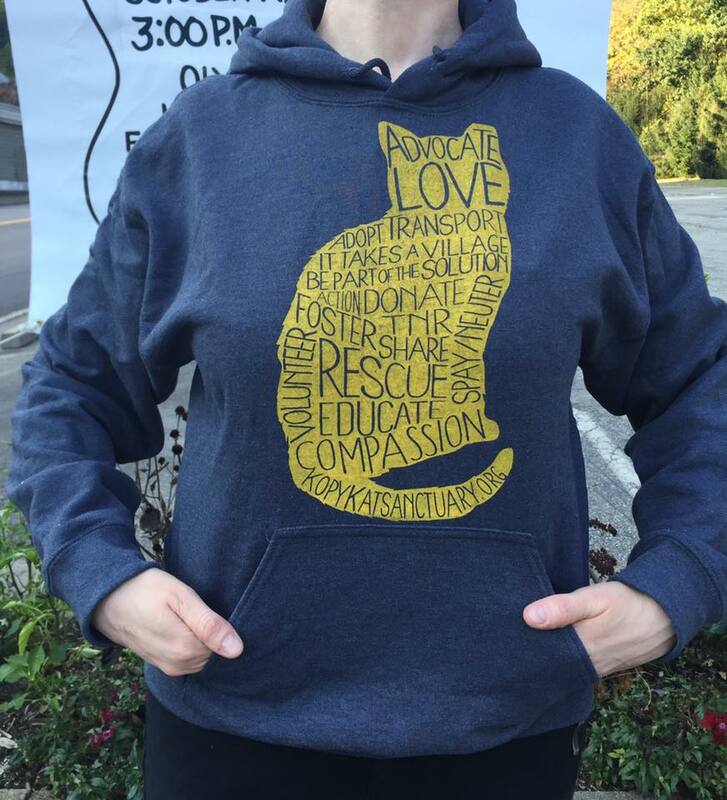 When you use the promo code KOPYKAT, you will receive a 5% discount and Purrfect Fence will donate a portion of the order value back to Kopy Kat. 100% of sales go directly to KKS. We take a 35 Gallon Latch Tote. Then we cut 2, 6″ squares (one on the end and one on the side). We line the inside bottom with insulation board. Then put in a 1 3/4″ thick cooler with two matching squares cut, stuff straw into the container. Extra insulation board is placed in the rear of the container to fill up the space. The final touch 1 clear vinyl door flap on one of the openings to help keep the elements out and the warmth in. $25/each. If you order 3 or more $20/each. Pick up in E.Pgh 15112 M-F. Must order in Advance. Email cowgirl1111@aol.com for more info or check them out on our FaceBook page. Do you have a DIABETIC cat or dog? The excess carbs and plant products found in may cat foods may be a primary cause that leads to diabetes, obesity ans UTI in cats. Young Again Pet Food (YAPF) was recommended by our vet after one of our cats was diagnosed with diabetes. We have nothing but positive things to say about the kind people at YAPF and their awesome products. After switching to this food our kitty went into remission and we encourage you to check out their website and place an order. AND RECEIVE 10% OFF YOUR FIRST ORDER AND FREE SHIPPING ON FOOD. 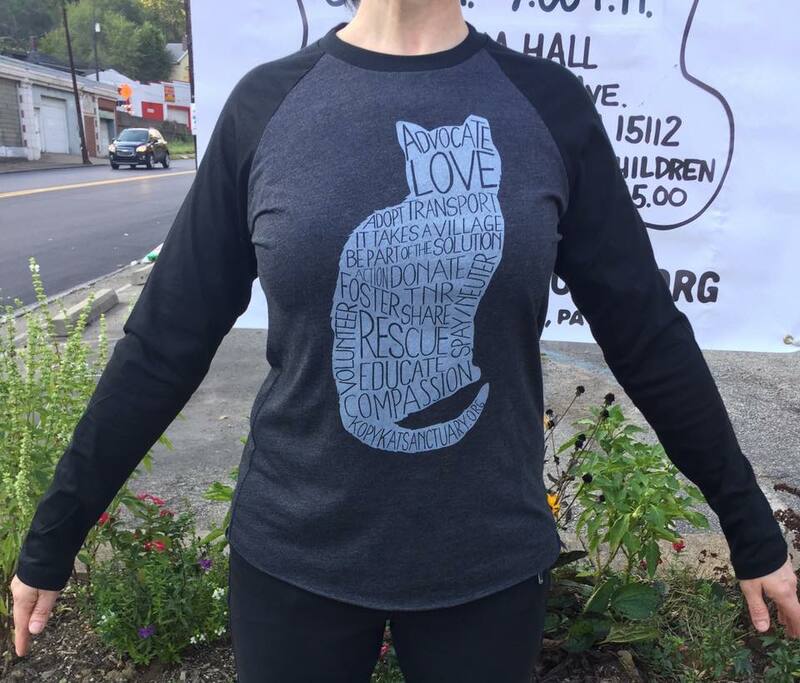 Kopy Kat Sanctuary Mission Statement: To provide shelter, food, water, love and veterinary care for cats and kittens at our Sanctuary for the remainder of their lives or until they are adopted into loving homes. To educate the public (and assist where possible within the Sanctuary’s time constraints and financial resources) of the importance of spay/neuter to reduce unwanted cat populations and to assist in establishing feral colonies at locations where unadoptable cats already exist.